The Bills made two important moves at defensive tackle on Tuesday. But that’s not what everyone was talking about. It was the move they didn’t make at quarterback that’s drawn the most attention from Bills fans. The contract agreement with Carolina Panthers defensive tackle Star Lotulelei was a no-brainer, and a move we all saw coming. 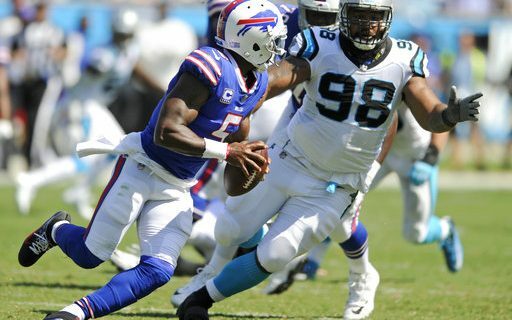 His familiarity with Sean McDermott from their time with the Panthers, combined with the Bills glaring need at DT made this a perfect marriage. Lotulelei is the perfect big body, run-stuffing space eater that the Bills need to fill the spot formerly held by Marcell Dareus. McDermott knows him, and knows what he can do. It’s yet another move by the Bills to fill a hole they now don’t have to fill in the draft. While maybe nothing other than coincidence, Lotulelei’s agreement on the same day the team re-signed Kyle Williams makes perfect sense. Williams can take a more limited role, and won’t have to lead the defensive line in snaps like he did in 2017. Williams is back for everything he brings to the team on and off the field. Keeping him fresher at age 34 will happen with Lotulelei and another DT addition, either through free agency or the draft. As the day went on, and the veteran quarterbacks started agreeing to contracts around the league, Bills fans seemed to start to worry. They have more talent on offense (Larry Fitzgerald, David Johnson) and are closer to winning than the Bills. 2. He knew the Bills are going to trade up in the Draft and take a franchise QB. Bradford probably didn’t want to be the guy who’s hold on the job lasts only as long as the team waits to move their new prize into the lineup. So what is left for the Bills to bring in to hold the job until Rosen/Darnold/Allen/Mayfield is ready? Not much. A.J. McCarron is out there, after not seeing any team make a move on him as a starter. Aged vets like Matt Moore and Drew Stanton are available, but they are really nothing more than backups. 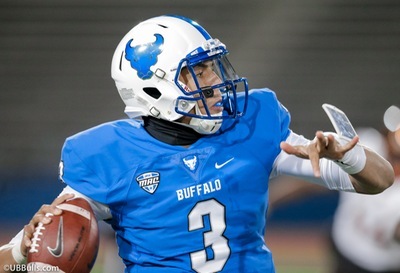 Looking at those options, I’m hoping the Bills are thinking only one way: Play the rookie quarterback right away. What does it serve to sign a Moore or Stanton, or trade for a Trevor Siemian and start them? You’re not going to win with them. Why bother? Just go ahead and play the rookie and let him learn. It’s worked with top picks like Marcus Mariota. Yes, other rookies have sat and watched. But there’s no right or wrong with this. Every case and every player is different. If the drafted rookie is really, really not ready to start…then go with Nathan Peterman. We know McDermott likes him. Could it be worse than Matt Moore? It might even be better. We all need to get beyond the first half against the Chargers. It does not define Peterman. Every QB has had bad games. The Bills will sign a QB on Wednesday. They need to have someone else to compete and be the backup. A veteran would be the best, with the backup role in mind. But whoever it is, I hope they are signed with the knowledge that the starting spot is NOT available. That job will be filled in late April. If we’re all in on the Bills trading up to get a franchise QB, and I think we all are, then let’s be ALL in.